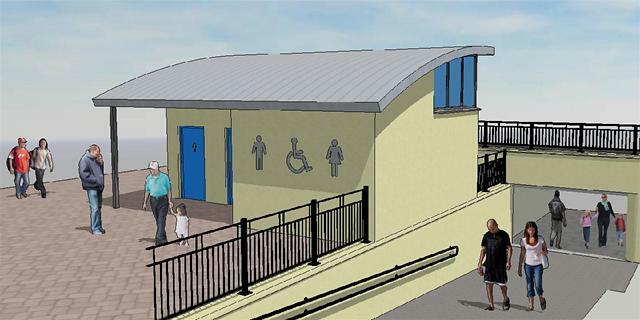 Work to create a brand new purpose-built toilet block at Bury Open Market will commence during April. The new facility will be built alongside the subway, adjacent to Edward Block as part of Bury Council's commitment to ensuring Bury Market continues to attract residents and visitors from far and wide. Councillor Mike Connolly, Leader of Bury Council said "As part of ongoing customer satisfaction surveys we regularly ask visitors to the market what improvements they would like to see. Residents and visitors alike told us they would like more toilets. So this is exactly what they are going to get in a traditionally-constructed building with coloured textured walls and an attractive sloping roof line. "This new facility adds positively to Bury's shopping offer and it will be a great asset to our already very successful and popular market. Added to this the investment demonstrates our commitment to local traders by ensuring the facilities on offer are amongst the best in the country." The new building will be built in a central position and although it will be visually apparent and convenient for market users, it will also be sympathetic to the market stalls around it. Regular dialogue is ongoing with market traders who are welcoming this development to ensure that any disruption due to construction works is kept to a minimum. Bury Market will be open for business as usual throughout the building works. Following a procurement process the construction contract was awarded to H.H Smith & Sons, a local building firm based in Whitefield. Work is scheduled to start on 14 April and should be completed in around 14 weeks.